Abhayagiri Monastery in Redwood Valley, California and the Sanghapala Foundation invite you to join Luang Por Pasanno, and others from the Abhayagiri Community for a 10-day retreat in December. 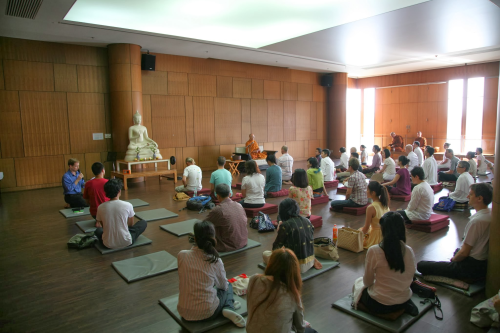 We will create a monastery environment during our time together, and we offer you this opportunity to explore the Dhamma in a setting that differs somewhat from a typical meditation retreat. We will all live the monastery life, following the Eight Precepts, taking only what is offered, and attempting to reflect on our every activity as part of our practice. This will include noble silence, morning and evening chanting, sitting and walking meditation, a work period, and daily Dhamma talks and teachings. The retreat will be held from Friday afternoon, December 6th, through Sunday morning, December 15, 2019, at the Applegate Jesuit Retreat Center, near the Sierra foothills. It’s a beautiful, very private 350-acre center, nestled in California’s historic gold country. The closest airport is Sacramento, about 50 miles SW of the center. Because of the length of this retreat and the adherence to the Eight Precepts, you must previously have sat at least one five-day meditation retreat. Retreatants are requested to attend the entire retreat, from registration time to the closing ceremony on Sunday morning at approx. 11am. The facility is accessible for people in wheelchairs. We are unable to accommodate special dietary or environmental needs. We will eat a hearty breakfast and, in keeping with this monastic tradition, the daily meal (vegetarian) is eaten before noon; there is no evening meal or use of kitchen. Incense and candles are used at the morning and evening chanting periods. Note that this is a double-occupancy rooming setup (there are only a few single rooms available for elders and those with serious medical conditions). This is a beautiful center with comfortable accommodations. Camping or trailers are not possible for our retreat. The retreat will be offered solely on dana (freewill donations); there is no set fee. Registration/lottery is open July 15 – August 15, 2019 and applicants will be notified early September. Please note: no deposit refunds after October 31, 2019. Thank you for your understanding.